When I launched the TiLT Parenting website in April 2016, I was excited to share with the world the TiLT Manifesto, a document outlining my vision for a more positive, more inclusive, and more all-around awesome experience for parents raising differently-wired kids, as well as my ideas for how we can get there together. Because it’s important to us that the ideas behind the TiLT Manifesto are consumed and shared as broadly as possible, and because I know that the Manifesto is a kind of a long read and one thing we parents of atypical kids don’t necessarily have a lot of lying around is spare time, I decided to dedicate an entire episode of the podcast to the Manifesto. In it, I not only share my personal story of how I shifted my experience raising Asher from one where I felt overwhelmingly frustrated, stressed, and isolated to one full of acceptance, optimism, and possibility, but I lay out 10 ideas for things we can start doing today to shift the parenting paradigm to one that embraces our kids and our experience raising them. 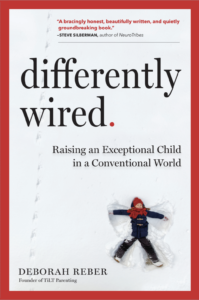 So, if you haven’t had a chance to read the Manifesto yet, or you have read it but could use a fresh burst of inspiration, I invite you to sit back and have a listen, and join me in imagining what could be when we join together to shift the experience for families with differently-wired kids. About Debbie: Debbie Reber, founder of TiLT and host of the TiLT Parenting Podcast, is a New York Times bestselling author, life coach, and speaker. Originally from the U.S., Debbie and her family moved to Amsterdam, the Netherlands, in 2013. When she’s not homeschooling Asher, working on TiLT, or writing books, she’s running, traveling, and reading.